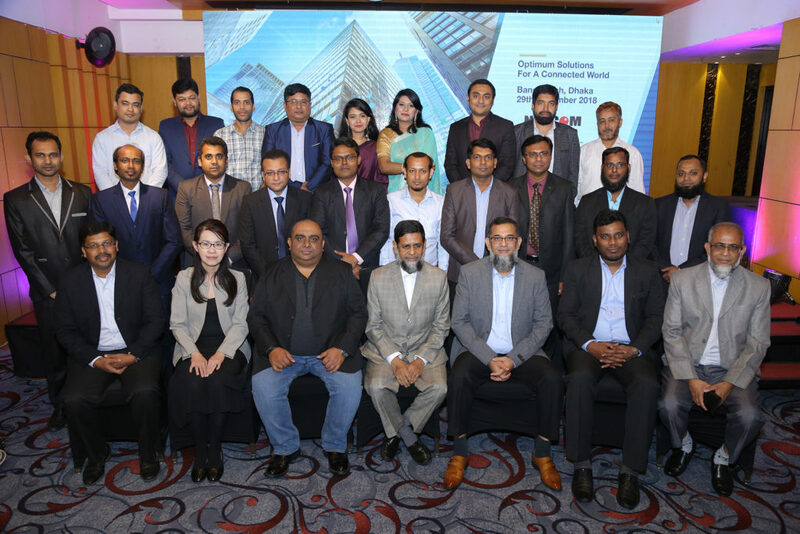 Panduit and Netcom jointly held a Technology Event on November 29th, 2018 at Hotel Amari, Gulshan, Dhaka. The Vice Chancellor, Prof. Dr. Chowdhury Mofizur Rahman of United International University, graced the event as its Chief Guest. The event was attended by key executives from the Pharmaceuticals, Education, Financial & Banking, Telecommunications, Manufacturing, Hospitality, Logistics, Information Technology, sectors of Bangladesh. The event started off, with key notes from the Chairman of Netcom Technologies (Pvt.) Ltd, Mr. Mohammad Shahidullah and The Regional Channel Manager from Panduit, Ms. Jolene Sim. A presentation on milestones achieved and the future roadmap of Netcom Technologies (Pvt.) Ltd was presented. Netcom Technologies (Pvt.) Ltd also showcased the Fluke DSX8000 Series Cable Analyzer, required for Site Certification System Warranty. It is worth mentioning, that Netcom is the only company in Bangladesh, that is positioned to provide complete Testing and Commissioning Services of the Physical Infrastructure utilizing Fluke Network Testing Equipment. Prof. Dr. Chowdhury Mofizur Rahman, Vice Chancellor of United International University delivered a key address outlining the developments of the university and the recent international case study based on its Enterprise Network and Data Center Infrastructure, which was designed, implemented, tested and commissioned by Netcom and Panduit. This is by far, the largest network implemented in a University in Bangladesh. Site Certified with a System Warranty of 25 Years. This is the first infrastructure in Bangladesh to have its Case Study published internationally. The Honorable Vice Chancellor was presented with the official published case study by Ms. Jolene Sim. Panduit and Netcom would like to thank The Vice Chancellor and his team for their continued support and cooperation. The second part of the evening consisted of an informative presentation covering Trends in the Enterprise Business and Data Centre Infrastructure Space. The presentation was delivered by Mr. Chandrashekar Gurumani, Technical Services Manager of Panduit. Mr. Chandrashekar highlighted and discussed trends and developments in Copper & Fiber Cabling, PoE++, Wireless Access, Data Centre Designs, Standards & Best Practices, Category 6A 10 GiG, OM5, Field Term Plugs, Small Diameter Patch Cords and Category 8 Cabling Solutions. For detailed information on the latest solutions and products of Panduit, please contact Netcom Technologies (Pvt.) Ltd. The event concluded with a gala dinner and a note of thanks to all participants. All Photographs of the event has been posted in the Album. Netcom Technologies (Pvt.) Ltd is the Only Authorized Distributor and Gold Certified System Integrator for Panduit in Bangladesh.